Bank of Canada governor Mark Carney has been appointed head of the Swiss-based Financial Stability Board. The announcement was made at the G20 summit in Cannes, France, on Friday. Finance Minister Jim Flaherty told CBC News that Carney will bring Canadian banking principles to the board. "This appointment of the governor is a credit not only to him but also to the Canadian financial system and our regulatory and supervisory system, which is a model for the world," Flaherty said. "We have the best financial system in the world, and that's being recognized." Prime Minister Stephen Harper echoed those sentiments in his closing statement at the G20 summit on Friday. "It is the first time a Canadian has headed an international financial institution of such wide scope," Harper said Friday from France. "His appointment is both a tribute to his personal qualities, and a reflection on Canada's superior performance in monetary, fiscal and financial sector policy areas." Carney will remain head of Canada's central bank as the FSB job is just part-time. His seven-year term atop the Bank of Canada expires in 2015. "The Canadian system worked during the challenges of the global financial crisis," BMO president Bill Downe said in reaction to Carney's appointment, "and one of the reasons why it worked is because there was early, open and frequent dialogue between Finance Minister Jim Flaherty, Governor Carney, Banking Superintendant Julie Dickson, and the CEOs of the banks and insurers." "There is a high level of trust between all of us — which continues to serve Canada and its financial system well," Downe said. Carney is the "right person at the right time," he said. Flaherty said holding both positions is possible because Carney will have excellent help both in Canada and Basel, Switzerland. The job will have the 46-year-old Carney, who was born in Fort Smith, N.W.T., lead the drive for global banking reform. A strong advocate of more stringent regulations for banks, Carney has said recently that the global financial system is safer now than it was but that there is still much more that needs to be done to make the system more responsive. "The decisions that are taken in Cannes at the end of next week will ratify a bunch of things that the FSB has been working on and set an agenda, a forward agenda, for the FSB," Carney said in an interview with Lang & O'Leary host Amanda Lang. "What will that agenda likely be? Part of it will be, in fairness, a policeman role — making sure that everybody implements what they’ve already agreed to do." 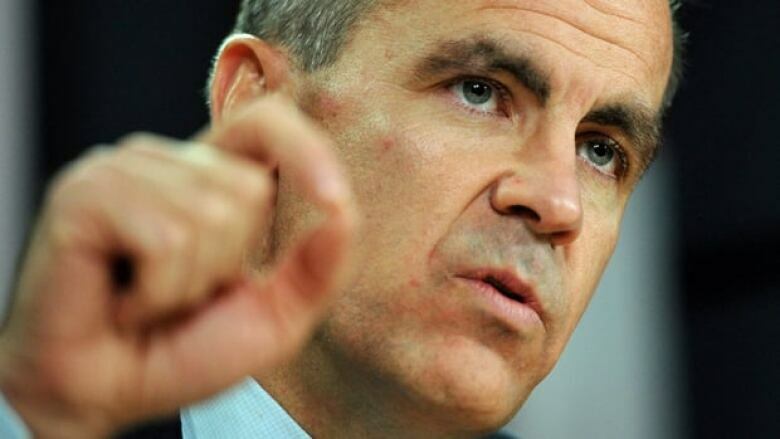 Carney has said the FSB's next priority will be to regulate the $60-trillion US shadow banking sector. "A lot of risk can come out of it that has to be tackled, and that’s what we’re here to work on," Carney said. The shadow banking system refers both to lending conducted outside the regular banking system and to related financial derivatives meant to insure lenders against losses. Before the financial crisis, derivatives trading was not done on transparent markets, meaning most people didn't know what banks would be threatened by a credit collapse. Some improvements to reporting those transactions have been made since then, but it remains largely unregulated. The value of that activity has swelled to its present level from an estimated $27 trillion in 2002, according the FSB. In 2009, the G20 founded the FSB to come up with tougher regulations to monitor and strengthen the entire global financial system. At the close of the G20 summit, the FSB put out a list of the 29 international banks it deems are "too big to fail." No Canadian names were on the list, despite the country's status as a major world financial hub. Widely expected to get the part-time posting, Carney may have sealed his appointment in September with his blunt response to American bankers chafing at looming new rules. "If some institutions feel pressure today, it is because they have done too little for too long, rather than because they are being asked to do too much, too soon," Carney told an audience at the Institute of International Finance in Washington, D.C. It's the kind of direct talk that has made Carney a darling of the international financial press and a nice fit for G20 leaders hoping to flex some muscle.